Our Own Flash Mob at Dubai Airport! Airports aren't really known for their "fun" factor especially during holiday travel. As Matt and I prepare for the 14 hour trek home for Christmas I'm already mentally preparing myself for the minefield that is the holiday flight to JFK. However, it turns out there are a few ways to make people smile in airports: upgrade them to business class, a sale at duty free, tell them the plane will be arriving early, and a flash mob! Terminal 1 played host to an energetic group of Fly Dubai air hostesses, Duty Free staff, passerbyers, and a few crazy kids who joined forces to bring us our very own flash mob in the Dubai (DXB) Airport. If you are looking for some fun and to put a smile on your face I highly recommend the below five minutes! The other great observation is the mix of people not only participating but watching the mob. This is a a great spot-check on the diversity of people that Dubai plays host to - and it's pretty awesome they all seem equally delighted - turns out there are things that bind us all and a flash mob might be one of them! Heck, if this happened at Christmas I might be willing to miss my flight - who am I kidding I would have joined in! 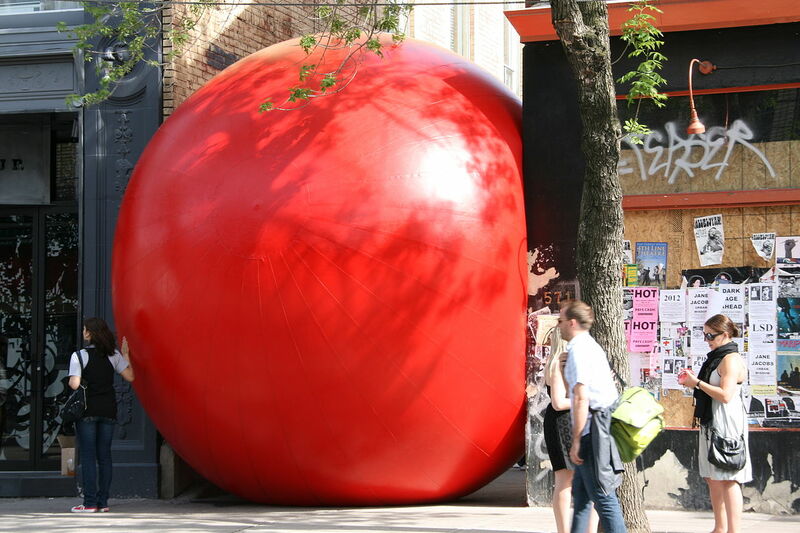 Has anyone heard of RedBall before? Well, I hadn't - so I thought nothing of the giant plastic toy wedged into the new Sheikh Zayed Bridge in Abu Dhabi. Then it was on the Corniche, the road right next to the water. 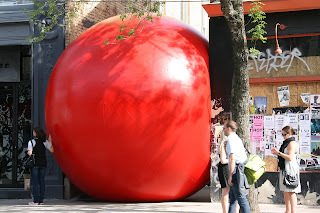 What kid is so irresponsible as to leave his giant ball all over the city? Apprently, Kurt Perschke is - and it's not just in Abu Dhabi. 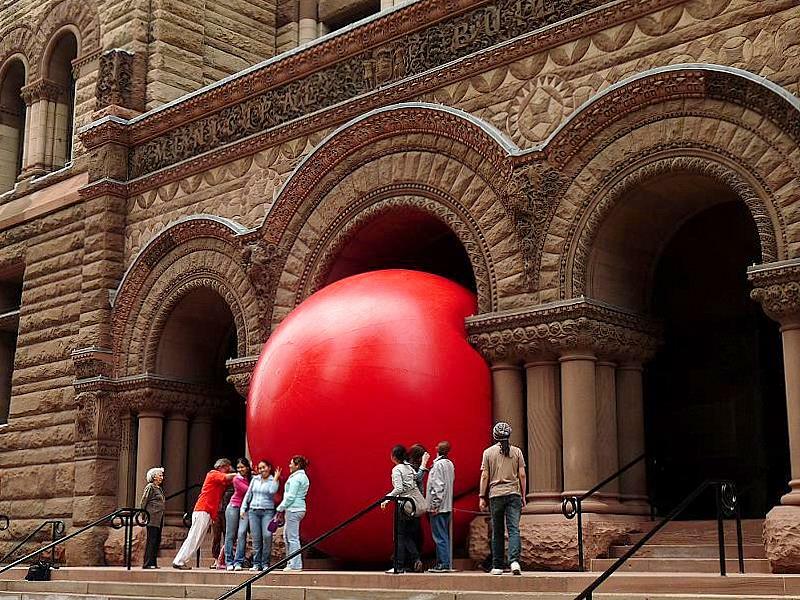 He's been absent-mindedly leaving his ball everywhere - in major cities all around the world. It shows up when anything interesting is happening - New Year's Eve, big elections, or in our case, the 40th Anniversary of the UAE's Independence in 1971. 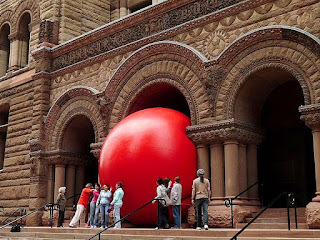 Appearing in entranceways, basking beneath bridges or wedged into alleyways, the irresistible RedBall sneaks into well-known places and half-noticed spaces, transforming the City into an unexpected canvas of possibilities. Photograph it, touch it or bounce against its slick soft surface. This award-winning project from New York artist Kurt Perschke pops up in 15 locations throughout the Festival, in Perth and the Great Southern. Keep your eyes peeled and your camera ready. Which is precisely what happened crossing the bridge into Abu Dhabi. Everywhere it goes, it takes on its surroundings - in this case, in true UAE tradition, causing rubbernecking and accidents on the highway! The United Arab Emirates turned 40 on Friday and she wears it well. Where as some of her fledgling country counterparts might be find approaching Over the Hill status a bit more challenging, the UAE slid into middle age with grace and style and I must say it looks good on her (although I swear she is using botox)! And how does the UAE celebrate her 40 years? With a national holiday, parades, classic car shows, and the wielding of swords for the most part, and the dancing...we have fireworks and hotdogs, but the Emaratis have a pretty good tradition of dancing for celebrations (with the aforementioned swords). The dancing below features Sheikh Mohammed bin Zayed, son of the beloved Sheikh Zayed, the first President of the UAE who is the Crown Prince of Abu Dhabi and Deputy Supreme Commander of the UAE Armed Forces. The crowd seems pretty excited to have him participate! Read on for a little history lesson. When the United Arab Emirates was created in December 1971, few outside observers gave it a chance of success. Many concluded that the UAE was "an artificial creation that stood to have no chance of success and that its evolution was largely an artefact of British colonial policy". Contrary to all these views, local observers saw in the creation of the UAE the embodiment of their long-time dream. Many believed that the creation of the UAE came as a natural outcome of the prevailing political, economic, social and cultural conditions of the area. Until their union, the shaikhdoms of the then "Trucial Coast" remained politically fragmented. They were disparate in size, ranging from small to tiny. Their lack of political and economic coherence increased their poverty. Against this background of differences, it is remarkable that the new polity was able to embrace an attitude of established nations. The UAE, a federation of the former seven Trucial shaikhdoms, followed the termination of British treaties of 1892. These treaties had stipulated that Britain would defend the emirates and conduct their foreign relations. Since 1892, the British thus maintained security by discouraging any foreign powers, European or regional, from intruding into the Gulf. In the early 1960s oil was first pumped from Abu Dhabi and in the late 1960s Dubai became an oil producer too. Negotiations for the British withdrawal also began and negotiations for the UAE's unification also started. All in all, the 1960s proved to be one of the most profound decades in the UAE's history. Locally the oil boom coincided with the increase of national feelings. In the sudden switch from tribal seclusion to international limelight, the shaikhdoms readily rose to the challenge and rapidly implemented the social responsibility to aid the more needy shaikhdoms. On his accession as president of the UAE in 1971, Shaikh Zayed was intent on rapid modernisation and generously distributed the newly acquired oil wealth equally among all emirates. It was due to Shaikh Zayed's generosity that the UAE entered a new era of development. 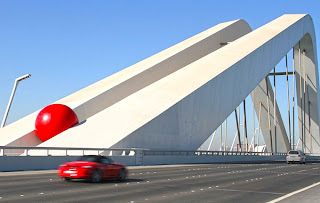 On December 1, 1971, the British flag was lowered, and the next day, six of the seven emirates united. The seventh, Ras Al Khaimah, joined the union on February 10, 1972. The rulers convened their meeting as the Supreme Council. During this meeting Shaikh Zayed was elected the state's first president. There are a lot of great events that happen during the fall and winter, when the weather turns nice and everyone heads outside to enjoy the seasonal festivities. However, Thanksgiving is sadly not one of those events. People get jazzed for Christmas, heck they even like the Fourth of July (all that BBQ) but unless you find yourself an American enclave and bag of Pepperidge Farm stuffing then the day can slip by with very little notice. For starters it's a work day here, so the holiday mood can be challenging when you wake up at 7:00am to hit the office. My feeble attempt at some Tday cheer was a hot cup of cinnamon tea and a nutri-grain apple bar - mmm, apple crisp (sort of). Matt and I had hummus and pita with halloumi salads for lunch - no turkey there...and I was just beginning to give up hope of properly celebrating one of my favorite holidays when our friends John and Lynze used their powerful Americandar - it's just like radar but for Americans (my battery must have been low)! To find out that the organic food restaurant next to our apartment was indeed making some festive treats! Yes, that's Matt's arm participating in the giving. Yearning for any semblance of the Thanksgiving spirit we joined them at the restaurant, who has the notable distinction of being right on the water where the fountains perform - not bad if you don't have football to watch - and a list of tasty tidbits just for the holiday. We could choose from apple cranberry sauce, homemade stuffing, grilled sweet potatoes, roasted chicken....uh...did you say chicken? Yes. Apparently Baker and Spice are so true to their organic mission that they would not serve turkey because they were unable to find any organically raised, so chicken was the order of the day. At that point my heart was yearning for turkey so bad I didn't care if it was raised next to a nuclear power plant - but I commend them to sticking to their guns (sort of). So chicken with all fixings it was to be. And because our meal was a bit non-traditional so were the thanks, we all decided to talk about a technology that changed our life - contact lenses, flight, and electric tea kettles were the order of the day. I thankfully was able to find some pumpkin pie! But I'll say this now, I'm making a plea for a Christmas turkey - hold the ham this year! I'm way under my quota now and I'm a pretty angry bird if you know what I mean! Itching for a Trip? Go to Ischia! Every once in awhile it's great to unplug. Matt and I enjoy staying connected through the blog, our Facebook status, and checking in on FourSquare but sometimes is great to not let anyone know where you are going. Which is why two months ago when we were blessed with a four day weekend after Ramadan, Matt's nimble fingers found their way to Jetsetter.com and snagged a last minute deal for us to go mingle with the awesome Italians. Blissfully unaware of all the trip details, I only asked that we actually find some time to relax (our vacations generally tend to be shall we say...aggressively scheduled). As with all things touched by Matt, the trip began to take on a life of it's own. We needed to book a car to drive down the coast to Naples (he naturally chose a convertible, despite having no trunk for the luggage), catch a ferry with our car to the island, and then upon return he threw in another night in Rome, before returning to Dubai. Matt's motto - if you can't do in 4 days, what you could accomplish in 8 - why bother? Our little getaway was looking a bit more complicated, but as they say: when in Rome! We checked in with our parents when we touched down ("you are where?" my Mom says exasperated) and headed down the coast to enjoy some fun in the sun. A little bit about Ischia. 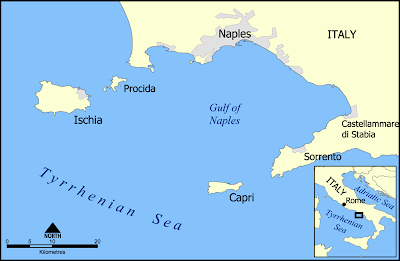 It's on the West coast of Italy, off the coast from Naples. Most people know her much more famous cousin Capri, but she can hold her own. The volcanic island is home to natural hot springs that mix with the sea water on the coast and her very own castle. 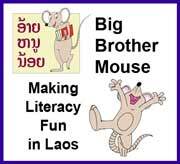 The island has shown up throughout history since about 730 BC in literature as a major trading point and as land of strategic importance between warring city-states. And is absolutely beautiful! Happy as a clam driving to Naples. Italians think that people who don't eat carbs are crazy - I tend to agree! These people can definitely do food right. This was a little "snack" of lemon sorbetti, they promised us it was not too big. We stayed at the fantastic Terme Manzi hotel on the island. It comes highly recommended. This was this indoor hot springs pool, the mineral water on the island is known for it's healthy and restorative properties. On our first night I really wanted to try this local restaurant that was recommended but it was on the other side of the island. We called to inquire about reservations and the guy on the other end said - "Where are you? Be ready in 20 minutes I'll come and get you." Nice! Door-to-door service from the youngest brother of five who own the family run business. They sat us in the lemon grove, where the trees are literally dripping with lemons, they were falling on our table all night! Yeah, we'll have the pizza. Mamma Mia! My hand is fully extended over my head and this string of cheese from the pizza will not break. Don't worry I wasn't afraid to use my teeth. But who says you can't play with your food? The next morning we had plenty of stored energy to explore the island. So my Prince Charming and I headed strait for the castle. The Castello Aragonese is a medieval castle which stands on a volcanic rock, it is the most impressive historical monument in Ischia, built by Hiero I of Syracuse in 474 BC. In 1441, Alfonso V of Aragon built a stone bridge which connected the rock to the island, and fortified the walls in order to defend the inhabitants from the raids of pirates. Here we are standing on the stone bridge that connects the island to the castle rock. The walk to the castle is filled with all kinds of fantastic stores! When life gives the Italians lemons - they make limoncello! Finally at the top of the castle you can see the island behind us and the stone bridge below. If you have any sense of how far this camera is from us for a self timed picture, you'll appreciate how fast Matt had to run in 10 seconds (and down a flight of stairs) to be in it! Going to the hot springs was such a unique experience! This is a rocky outcropping at the southern point of the island where the soil under the water hides cracks where the thermal water comes up. It mixes with the sea water and the end result is a natural jacuzzi in the ocean! You have to be careful! If you slip and fall in you could be severely burned. Some of the water closest to the shore is almost near boiling so you have to gingerly make your way out to cooler temperatures. The Terme Manzi has a Michelin starred restaurant the Gli Ulivi and we decided that our anniversary was close enough around the corner for a treat. This was truly a 'feast for the eyes'. It was some of the most stunning presentation that I've seen. 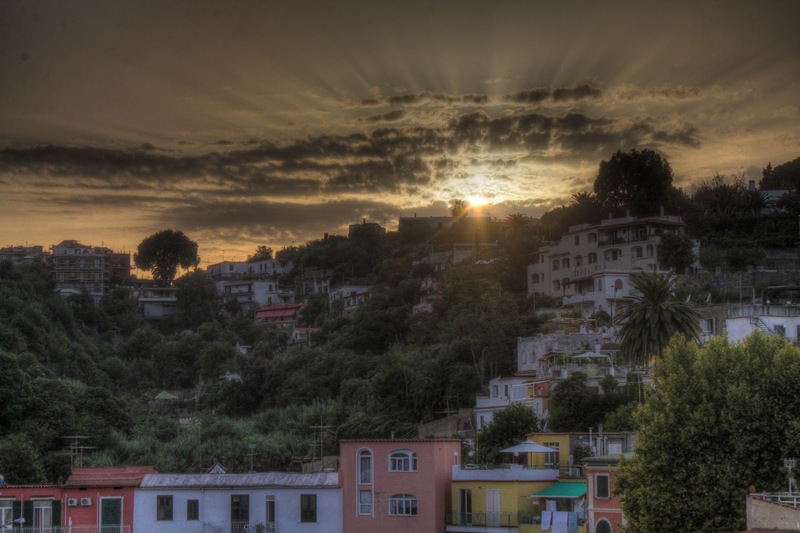 The sunset on the last day in Ischia gave the impression that now, the island was just showing off! If this isn't a testament to accruing hotel points, I don't know what is! We stayed for one glorious night at the St. Regis Rome (on points!) It is classic and beautiful, and a total jewel from a bygone era. When it opened on January 11, 1894, it was Le Grand Hotel, the newest venture of Cesar Ritz, the Swiss hotelier whose name was to become a synonym for high style and found its way, some decades hence, in the Irving Berlin tune: “Puttin’ on the Ritz.” The inaugural gala which featured a concert conducted by a leading maestro of the time. Each room is named for the hand painted mural that sits behind the bed. And while I could have laid in bed for the rest of the afternoon just staring at the room - it was time to hit the streets! Rome has a very special place in our hearts. Matt and I took our first trip together here six years ago. 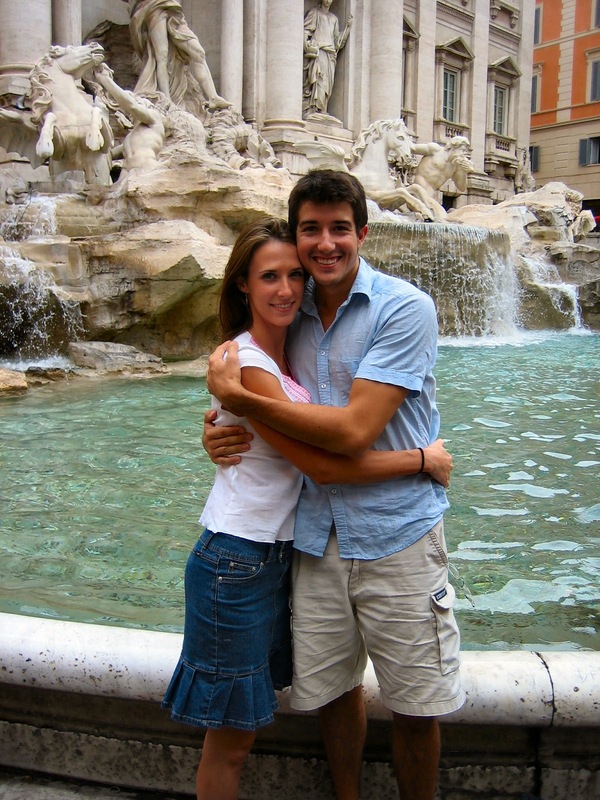 Three months after meeting he whisked me away to the Eternal City and we both tossed a coin in the Trevi Fountain. Six years ago (almost to the day)! Our wishes must have come true, as we celebrate six happy years and our second wedding anniversary! Love it. Every time. The incomparable Pantheon. Summer night in the Piazza della Rotonda (the Pantheon). No trip to Rome is complete without a trip to Giolitti. We always skip dessert and come here for gelatti. Wonder if the Pope lets you make house calls this time of night? We are a little obsessed with Bernini's sculptures and this fountain was no exception. The hotel fittingly decided to go with the brand. 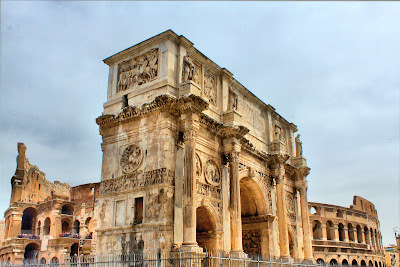 The Arch of Constantine built 315AD. This one needs to introduction.